Only about half of the violent crimes and a third of the property crimes that occur in the United States each year are reported to police. And most of the crimes that are reported don’t result in the arrest, charging and prosecution of a suspect, according to government statistics. In 2015, the most recent year for which data are available, 47% of the violent crimes and 35% of the property crimes tracked by the Bureau of Justice Statistics were reported to police. Those figures come from an annual BJS survey of 90,000 households, which asks Americans ages 12 and older whether they were victims of a crime in the past six months and, if so, whether they reported that crime to law enforcement or not. Even when violent and property crimes are reported to police, they’re often not solved – at least based on a measure known as the clearance rate. That’s the share of cases each year that are closed, or “cleared,” through the arrest, charging and referral of a suspect for prosecution. In 2015, 46% of the violent crimes and 19% of the property crimes reported to police in the U.S. were cleared, according to FBI data. 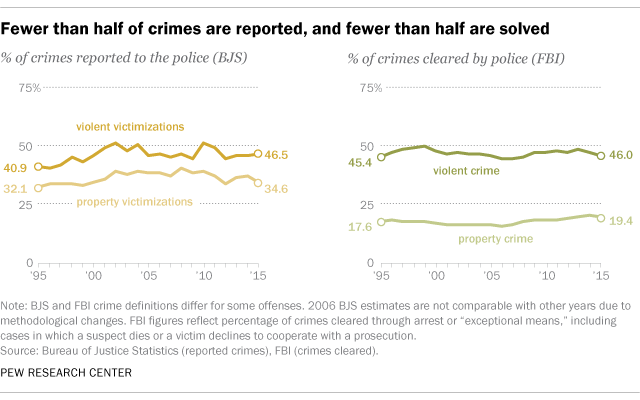 Reporting and clearance rates for violent and property crimes have held relatively steady over the past two decades, even as overall crime rates in both categories have declined sharply. Between 1995 and 2015, the share of violent crimes reported to police each year ranged from 40% to 51%; for property crimes, the share ranged from 32% to 40%. During the same period, the share of violent crimes cleared by police ranged from 44% to 50%; for property crimes, annual clearance rates ranged from 16% to 20%. There are several caveats to keep in mind when considering statistics like these. Like all surveys, the BJS survey has a margin of error, which means that the share of violent and property crimes reported to police might be higher or lower than estimated. The FBI clearance rate data, for their part, rely on information voluntarily reported by local law enforcement agencies around the country, and not all departments participate. The FBI’s clearance rates also don’t account for the fact that crimes reported in one year might be cleared in a future year. In addition, they count some cases that weren’t closed through arrest, but through “exceptional means,” such as when a suspect dies or a victim declines to cooperate with a prosecution. The two agencies also don’t track all of the same crimes, even though there is substantial overlap. The BJS survey excludes the crime of murder, for example, while the FBI includes it. And BJS counts some crimes – including attempted robberies and simple assaults – that are excluded by the FBI. Still, looking at the data collected by the two agencies provides a big-picture view of the kinds of crimes that are likeliest to be reported to police and the kinds that are likeliest to be solved. And it shows that there is significant variation in the reporting and solving of crimes, depending on the specific kind of offense. Of the individual property crimes tracked by BJS, for example, theft is the least likely to be reported to police (possibly because it is also the most common form of property crime). Only 29% of thefts were reported in 2015. By comparison, half of household burglaries (51%) and about seven-in-ten motor vehicle thefts (69%) were reported. Among violent crimes, just a third (33%) of rapes and sexual assaults were reported to police in 2015. Simple assaults were reported 42% of the time, while robberies and aggravated assaults were each reported 62% of the time. A 2012 BJS study found that a victim of a violent crime might choose not to report it to police for a variety of reasons, with the most common being that they dealt with it in another way, such as by reporting it to a manager or school official instead of to law enforcement. Police clearance rates also vary significantly by crime type. Only 13% of burglaries, 13% of motor vehicle thefts and 22% of larcenies and thefts were cleared in 2015. By comparison, police cleared 29% of robberies, 38% of rapes and 54% of aggravated assaults in 2015. When it comes to deadly crimes, Chicago has drawn widespread attention recently for its historically low murder clearance rate in 2016. But murder is actually the crime that’s most likely to be solved, at least when looking at national statistics. In 2015, 62% of murders and non-negligent homicides in the U.S. were cleared. That rate hasn’t changed much since 1995, but it’s far lower than in 1965, when more than 90% of murders in the U.S. were solved.